Enter 'Sandman': Anniversary Edition Celebrates 30 Years Of Dream-Spinning Neil Gaiman's most famous creation first appeared in the comics 30 years ago, but the Sandman is still shaping our dreams — and his stories look and feel just as cool now as they did in 1989. When Neil Gaiman first envisioned the Sandman, the supernatural dream lord he created 30 years ago, he thought about prison. "Before I even knew who he was," Gaiman writes in the afterword to The Sandman Vol. 1: Preludes and Nocturnes, he had the image of "a man, young, pale and naked, imprisoned in a tiny cell, waiting until his captors passed away, willing to wait until the room he was in crumbled to dust." Dreams and imprisonment? It's not a connection most would make. True, dreams are just about the only thing a prisoner has of his own, but it seems odd to imagine the bringer of dreams himself trapped in a cell. As so often happens with Gaiman, though, meditating upon one of his intuitions leads you to a whole new way of thinking. A dream, after all – a real dream, not a daydream – is a prison for the mind. While you're asleep, you're at the mercy of whatever stories and memories your psyche kicks up. If there really were a being with control over all our mind-prisons, he'd have incredible power. And if such a being were himself imprisoned – well, you'd have the stories in this book. 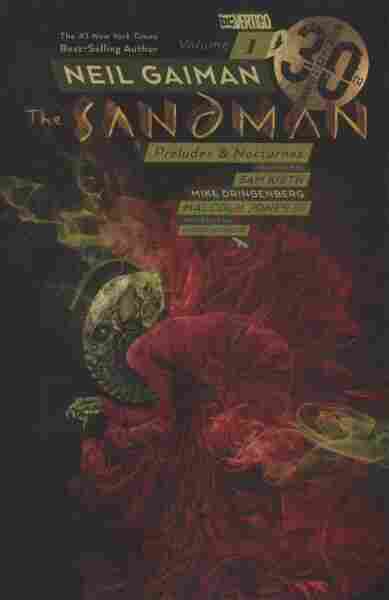 Containing the first eight issues of the Sandman comic, Preludes and Nocturnes displays the exploratory thoughtworld of creators who had no idea their conception would ignite imaginations for decades to come. Running for 75 issues (and yielding various spinoffs), Sandman has related as many tales as its central figure has names. (Some of those names are introduced in this volume: Morpheus, the Prince of Stories and, first and foremost, simply Dream.) And it all started with a man in a cage. The story becomes more complex (and more disturbing) when Doctor Destiny, a sociopath inside Arkham Asylum, gets hold of Dream's ruby. This stone, "created from the fabric of [Dream's] being ... to manipulate the fabric of dreams," enables "Dee" to control people's actions, beliefs, and even their sense of time. He tortures a group of diner customers in "24 Hours," which Gaiman calls "one of the very few genuinely horrific tales I've written." The customers' fate isn't particularly gory; it's what Dee does to their minds that's nauseating. In 1988 it was cool for Dream to look like Robert Smith and his sister Death ... to be an elfin Goth princess with an ankh necklace. An artist working today could conceive these characters the very same way, and it would be just as cool. The introduction of Dee seems to set something loose in artists Sam Kieth and Malcolm Jones III. Dee's early life and his duels with the Sandman feature wild tonal shifts, fractured and distorted panels and touches of collage. But just as appealing are Kieth and Mike Dringenberg's illustrations of the comparatively more straightforward early stories. "Sleep of the Just" is a high-spirited horror tale crowded with movement and humor; Dream's escape from his human captors is particularly powerful. "A Hope in Hell," in which Dream must battle a demon for his stolen helmet, gives Kieth and Dringenberg an opportunity every artist longs for: the chance to depict you-know-where. They make the most of it. The most impressive thing about this book, though, is its contemporary feel. In 1988 it was cool for Dream to look like Robert Smith and his sister Death (who turns up in the last story) to be an elfin Goth princess with an ankh necklace. An artist working today could conceive these characters the very same way, and it would be just as cool. (Perhaps minus the necklace.) Thirty years after Gaiman first dreamed of his man in a cage, the Sandman's still shaping our dreams. Who's the prisoner now?